Chocolate Mousse Flavored Instant Pudding MixJell-O Chocolate Mousse flavored pudding mix makes an amazing dessert. Everyone loves its rich flavor and luscious creamy texture!It does not require a lot of time and effort to prepare. Hence, all- time favorite dessert and snack! Use the pudding between layers of a layer-cake or add it to cake batter for a moister cake, or use in trifles.Creamy Texture, Delicious Flavor!Everyone loves the indulgent flavor of a creamy, rich, Chocolate Mousse pudding. 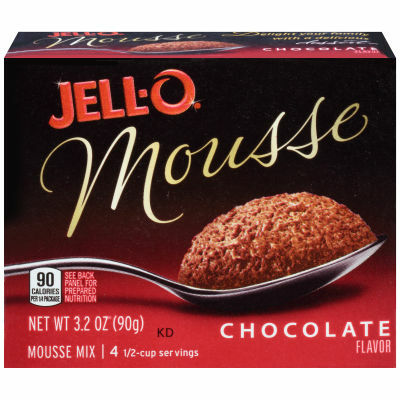 Jell-O Chocolate Mousse flavored pudding mix makes a delicious dessert in 5 minutes; all you need to do is add milk and allow to set. If you have to prepare something sweet instantly, Jell-O Chocolate Mousse flavored pudding is the best, with a deep rich Chocolate Mousse flavor. It cures the craving for a dessert in an instant. Its rich flavor and creamy texture will make you & your guests miss your grandma's homemade pudding. Serving size 1/4 package (23g).